Caroline Bruckner doesn't work on Capitol Hill anymore, but she regularly finds herself back there. Before her current role as the managing director of the Kogod Tax Policy Center, Bruckner served as the chief counsel to the U.S. Senate Committee on Small Business and Entrepreneurship (SBC), where she advised on tax, finance, budget and labor issues. 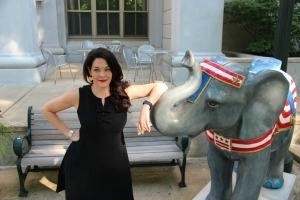 Her government experience informs her job at Kogod quite a bit, particularly with research reports like Billion Dollar Blind Spot: How the U.S. Tax Code's Small Business Expenditures Impact Women Business Owners , which was released June 12. Since publishing the report, Bruckner has leveraged her connections and knowledge of government to promote her findings. She prepared questions for Sen. Jeanne Shaheen based on the report's findings during a SBC hearing; entered written testimony into the public record for other hearings; and met with influential stakeholders to win support for the report's recommendations to develop additional research. "Our report is groundbreaking," Bruckner says, "but there's a lot more work to do." Blindspot used survey data conducted by Women Impacting Public Policy, a national nonpartisan organization advocating on behalf of women entrepreneurs, to determine how the tax code affected their businesses. "We found that women are effectively disadvantaged because of the industries that they're in and the way that they organized their businesses." With the Trump administration's focus on revising the tax code, tax policy discussions have been heating up-and Bruckner is working to ensure that Kogod's research is a part of the agenda on Capitol Hill. According to the report, most women-owned businesses operate in the service industry. While women have been starting businesses at greater rates than their male counterparts over the past decade, those businesses haven't been growing to the same extent since they don't have the ability to borrow similar levels of capital. Service businesses are considered less scalable and the tax code does not grant them equal access to government-issued funding. "Changing policies that affect this specific group of small-business tax payers could be a key to unlocking growth for parts of the economy that we've never considered," Bruckner says. Since the American economy has shifted away from businesses like manufacturing, it could be wise to grant businesses that align better with current economic trends greater access to capital. Brent Sabot, the research assistant who worked on the report, stressed the economy is changing. "Women are owning more firms, and they're operating in different industries than the industries of small businesses in decades past," he says. "If Congress doesn't identify these changes and the challenges that come with operating a business in the modern economy, the legislation that comes out of Congress will not fully be evidence-based, and everyone can agree that that's bad tax policy." At Bruckner's request, Sabot spent hours combing through the records from Senate committee hearings dating back to the 1980s to try and find evidence of Congressional discussion on the tax code's impact on women business owners. They never found any-and they weren't expecting to. "We don't look at the tax code in terms of gender or race," Bruckner says. While Congress has examined the challenges faced by women business owners, these issues have never been scrutinized through the lens of the tax code. "We want to constructively encourage [lawmakers] to hold hearings to incorporate the needs of [women business owners], the fastest growing cohort of small business owners, into future tax legislation," Sabot says. To understand why we don't have the information necessary to make informed changes to the tax code, it's important to understand the history of women business ownership and evolutions in tax policy. "That's why we started the report with a timeline," Bruckner says. The first page of the report has a detailed chronology, starting with the passage of the 16th amendment, which ratified the individual income tax and made women subject to federal taxes before they even had the right to vote. Bruckner cautions that she's not advocating for specific changes to the tax code…at least not yet. Since there's been so little historical research on women business owners and their relationship with tax policies, there's a large data deficit that needs to be overcome before thoughtful changes to the tax code can be made. "Before we revise the tax code, we should just start with collecting data. You don't want to start developing policy before you have good stats," Bruckner says. The Tax Policy Center and Bruckner can't do the research alone. They're trying to raise awareness and provide government with the right questions they need to ask in order to pursue policy with the greatest benefit-both for women and the American economy. While she believes that Billion Dollar Blind Spot is an important step forward, it's just the beginning. Read more about the report and view the full pdf online.